I’ve never been to Japan but I do watch the Japanese channel that comes in my cable television package. The programming is in English, so I understand what everyone is saying, but I have to ask one thing: What the heck do Japanese girls wear on their lower halves in gym class? Maybe they are supposed to be shorts, but they look like skimpy underwear to me. Is it proper in Japan for girls to wear such revealing clothes at school? Those are called burumā, from the English word “bloomers,” a linguistic borrowing that throws native English speakers every time because we associate that word with loose ladies’ trousers that gather mid-leg or lower. But to most Japanese, “bloomers” conjures up exactly what you’ve described — tiny high-cut gym shorts that hug the body and expose the entire thigh. Part of what’s so interesting about your question is that this style of gym wear is no longer used in Japanese schools. burumā fell out of favor in the 1990s, replaced in short order by unisex, longer-legged shorts. But as your inquiry attests, burumā live on in infamy, their memory lovingly preserved in manga, anime and on fetish websites. Lest you get the wrong idea about my online habits, let me explain I always start my research with an Internet search. That usually goes well, but this time it was a fiasco. When I entered “burumā” I got over 3 million matches in Google alone. The vast majority were for sites geared to burumāmania — people, presumably men, who get a sexual charge out of burumā. Hoping for something a little more staid, I hit the library, where I found plenty of interesting materials including a book titled “burumā no Shakai-shi” (“A Social History of Bloomers,” Takahashi et al, Seikyusha, 2005). I learned that an educator named Akuri Inokuchi (1871-1931) was sent by the Japanese government to study at Smith College in the United States. When she returned she brought back new ideas in women’s physical education, including gymnastics, basketball and bloomers, an innovative new garment that made it easier for women to exercise. During the Taisho (1912-1926) and Showa (1926-1989) eras, the legs on bloomers gradually got shorter for ease of movement. An intermediate stage was the chōchin (lantern) burumā, made of woven cloth, which had elasticized legs that fell mid-thigh and puffed out like a lantern. The final and fatal metamorphosis, which started around the mid-1960s, was a drastic minimization into the pittari (tight-fitting) burumā. I just assumed the government decides what students wear in gym class, so I went to the Ministry of Education, Culture, Sports, Science and Technology to find out when pittari burumā were introduced in schools. I was soon set straight by Yutaka Sato, a curriculum specialist for physical education, who explained that the education ministry has never regulated gym wear. “The curriculum guidelines recommend that clothing allow free movement,” Sato told me, “but other than that, schools have always been free to make their own decisions on gym clothes.” Most schools in Japan try to minimize economic differences between students, and ensure that school clothes are functional and appropriate, by setting a standard uniform. This usually includes a separate set of clothing for physical education and school sports. The pittari type of burumā became popular after the 1964 Tokyo Olympics, when the Japanese women’s volleyball team, wearing loose fitting bottoms, went up against foreign players decked out in skimpy modern uniforms. Japan won the gold medal but the public consensus was that the foreign players — in their barely-there bottoms — looked a whole lot cooler. Several factors helped move pittari burumā out of the realm of elite athletes and into public and private schools all over Japan. Advancements in domestic production of synthetic fibers allowed for stretchy garments at cheap prices, a big plus for school wear. Another big push came from “Atakku Nanba Wan,” a manga by Chikako Urano about a girls’ volleyball team. Serialized in a popular magazine from 1968 to 1970, the story featured active heroines in pittari burumā, greatly enhancing the garment’s cool quotient. For all their ease of movement, the pittari burumā had serious drawbacks. My friend Yoshiko recalls that they didn’t always cover underwear, leading to a dreaded condition known colloquially as “hamipan” (a contraction of the words “hamidasu” [to stick out] and “pantsu” [underpants]). And many students felt self-conscious in such revealing bottoms, particularly when they were dealing with the body changes brought on by adolescence. Such complaints were borne largely in silence until the early 1990s. 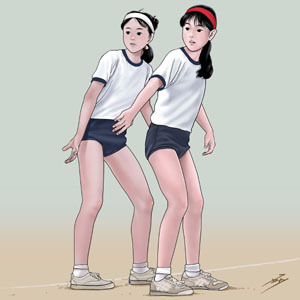 Most sources trace the anti-burumā movement to the Japanese school in Singapore, where in 1993 students opposed an effort by the school to make tight-fitting bloomers compulsory. Female students complained that the revealing bottoms attracted unwelcome attention when they jogged off school grounds. The school countered that the protesting students were a wagamama (selfish) minority, and the resulting flap made the newspapers back in Japan. That coverage seems to have raised the consciousness of women all over Japan, and unleashed a groundswell of anger. Letters to the editor poured into the paper, some charging that forcing schoolgirls to wear burumā constituted sexual harassment. Mothers who had themselves worn burumā agitated to spare their daughters the experience. The next five to 10 years saw a rapid decrease in burumā use, with some schools responding faster than others. In Saitama Prefecture, Koshigaya Minami Senior High School eliminated burumā right away in 1993, while the elementary school my two sons attended in Tokyo didn’t phase them out until 2002. I had forgotten all this until I got your question, but I do remember thinking burumā were cute on the little kids but totally inappropriate for girls entering puberty. And that, I’d say, is pretty much the long and the short of burumā. For more information on this topic, please visit my new blog at alicegordenker.wordpress.com. Puzzled by something you’ve seen? Ask away to whattheheckjt@yahoo.co. jp or A&E Dept., The Japan Times, 5-4, Shibaura 4-chome, Minato-ku, Tokyo 108-8071.